Wonder at myriad birdlife present in Southern Africa, up to 400+ different species in some locations. Marvel at the beauty of Victoria Falls, one of the Seven Natural Wonders of the World. Search for the “Big Five” (lion, leopard, elephant, rhino and Cape buffalo) while on safari in Hwange and Chobe National Park and a private concession in Zimbabwe. Embark on the birding adventure of a lifetime in some of Southern Africa’s most renowned national parks. Search for beautiful and exotic species such as carmine bee-eaters, rock pratincoles, western banded snake eagles, African jacanas, sacred ibis and countless more. Be there at the optimal time of year, as migratory birds are in the area, and learn from local experts who speak in-depth about the birdlife, wildlife, flora and cultures you encounter. Activity note: Hotel check-in from 2:00 p.m. Afternoon: After clearing customs and immigration, you will be met and transferred approximately 15 minutes to Courtyard Hotel Eastgate. Check in at the hotel and relax before the welcome dinner. Dinner: Our welcome dinner at the hotel will be a buffet featuring a starter and entrée with side dishes. A welcome drink, bottled water and coffee/tea will be provided; additional beverages available for purchase. Evening: Orientation: The Group Leader will greet everyone with a warm welcome and lead introductions. We will review the program theme, the up-to-date Daily Schedule and any changes, discuss logistics, safety guidelines, emergency procedures, roles and responsibilities, and answer any questions. We have set aside some free time in the schedule for your personal independent exploration. Please note that program activities, schedules, and personnel may need to change due to local circumstances. In the event of changes, we will alert you as quickly as possible. Thank you for your understanding. We are fortunate to have as our Group Leader a knowledgeable expert who will also serve as our primary lecturer for most of the program. Continue getting to know your fellow participants, settle in, and get a good night’s rest for the day ahead. Activity note: The birding today is done on foot; total distance covered may be up to 3 miles on paved walkways. Breakfast: Taken at the hotel, breakfast will be an expansive buffet featuring a variety of cold cereals, fresh fruit, cold meats and cheeses, pastries and hot items such as bacon, sausage, tomatoes and mushrooms. Omelettes, eggs and waffles are cooked on demand. Fruit juices, coffee, tea and water provided. Morning: Transfer by motorcoach east of Johannesburg to the Marievale Bird Sanctuary, a provincial nature reserve that has been designated an Important Bird Area in South Africa. 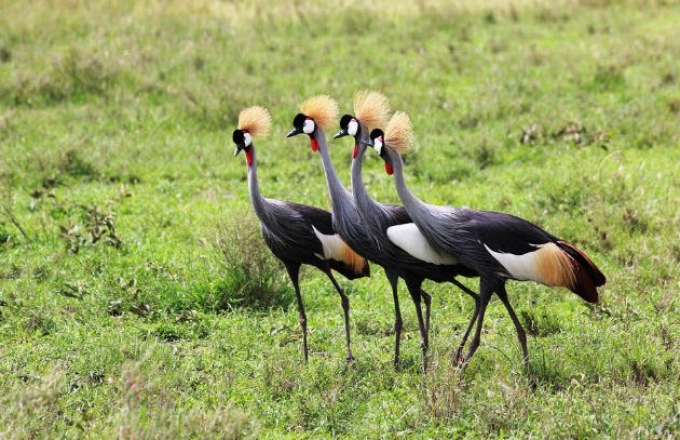 Marievale has been shaped by the gold mining activities in the area; much of the water that fills the floodplain has been pumped up from underground, creating a body of water that attracts an extraordinary number of birds. Habitats within the sanctuary include shallow open water, reedbeds and grassland, so the variety of birds is impressive with some 280 species having been recorded in the area. Here one can often see specials like little bittern, slaty egrets, black and squacco herons, and handsome red-knobbed coots along with the usual aquatic species such as African rails, crakes, moorhens, cormorants and snipes. Additionally, it may well be the only place in the Gauteng region where it is relatively easy to see fulvous duck and South African shelduck. The wetland sanctuary does have a history of attracting extremely rare vagrants, with past sightings including buff-spotted flufftails, buff-breasted sandpiper, and a black-tailed godwit. In the company of our Group Leader, we will bird the varied environments in Marievale. Afternoon: Continued birding in Marievale. In the mid-afternoon, we will return to the hotel with time to rest and relax before dinner. Activity note: Flight time is 1 hour 45 minutes. In order to access all of the viewpoints at Victoria Falls, one must go up and down around 150 stairs one way; the path may be slick due to the waterfall's mist, too. It is possible to still see the waterfall without climbing all of the stairs, but only from one viewpoint. Morning: This morning, we will transfer to the airport to board our commercial flight to Livingstone, Zambia. Afternoon: Early afternoon arrival in Livingstone. After settling into our rooms, our group leader will give us an overview of Zambia. Afterward, we will visit the famed Victoria Falls, where the Zambezi River opens out into an extravaganza of roaring, spray-tumbled water, known to the locals as “Mosi oa Tunya” (the smoke that thunders). Few sights are as awe-inspiring as this, when the ground rumbles with the forces of the water. We will view the Falls this afternoon from the Zambian side, followed by a visit to the local crafts market. Dinner: Dinners at the lodge will vary each night between set menu plated choices and buffet options. There will always be a starter, main meat or vegetarian entree with assorted vegetable or starch side dishes, and a dessert. Bottled water and table wine provided, with additional drinks available for purchase. Breakfast: Breakfasts at the lodge will be a buffet consisting of many bread, cereal and fruit choices in addition to various hot English-style breakfast dishes. Morning: In the early morning, we will embark on a boat cruise on the Zambezi River for birding along the river banks. Interesting species sighted may include the half-collared kingfisher, Schalow’s turaco, red-chested flufftail and African skimmer. Light, Continental breakfast snacks will be served on board the boat, and a full breakfast will be available at the lodge upon our return. In the late morning, we will transfer into Livingstone for a guided excursion of the town and its colorful produce market. Livingstone is a classic old colonial town of former Northern Rhodesia, which can still be seen in some of its architecture. We will also visit the Livingstone Museum, known for its archaeological and ethnographic displays, but most notably for its artifacts that belonged to Dr. David Livingstone. We will return to the lodge in time for lunch. Lunch: Lunches at the lodge will vary each day between set menu plated choices and buffet options. There will always be a starter, main meat or vegetarian entree with assorted vegetable or starch side dishes, and a dessert. Water, tea and coffee provided, with additional beverages available for purchase. Afternoon: Free Time. Take this opportunity for personal independent exploration to see and do what interests you most. Please refer to the list of Free Time Opportunities. The Group Leader will be happy to offer suggestions. Activity note: In order to see all viewpoints at the Falls, approximate length of walk is two miles. It is possible to walk less and see some, but not all, viewpoints. Paths may be slick from mist, but are mostly flat. Drive time between Livingstone and Victoria Falls is approximately 1 hour including border crossing. Drive time between Victoria Falls and Imbabala Lodge is 1 hour. All transfers done in enclosed minibuses. Morning: Our Group Leader leads an early morning bird walk on the lodge grounds for those interested; keep an eye out for the pied kingfisher, scimitar-billed hoopoe, white fronted lapwing and pearl spotted owl. After breakfast, we will transfer over the border into Zimbabwe, where we will see Victoria Falls on the Zimbabwean side. Since the waterfall spans the border between Zambia and Zimbabwe, it is visible from both countries, but viewing from the Zimbabwean side is preferred as more of the waterfall falls on this side. Here our Group Leader will show us how, through the millennia, the forces of nature have created this marvelous spectacle, Africa’s greatest waterfall. The rainforest around the Falls also offers a great birding opportunity, with species such as Livingstone's turaco, carmine bee-eaters, rock pratincole, European storks and Lilian's lovebird being spotted. Afterward, we will continue on to Imbabala Lodge to settle in and enjoy the riverfront scenery. Lunch: Lunches at the lodge will be a small buffet with starter salad, main entree and side dish, and dessert. All beverages, excluding premium-brand alcohol, will be included. Afternoon: Over afternoon tea, our Group Leader will give a lecture, "Overview of Zimbabwe." Then, we will embark on a late afternoon game drive in the private reserve surrounding the lodge. The 5,000 acre national park concession has nearly nine miles of private Zambezi River frontage. The reserve also borders the Chobe Forest Reserve, which is renowned for its massive elephant population. Game drives will be in open-air safari vehicles in the early mornings and late afternoons, when the animals are most active. Each game drive lasts for approximately three hours, with a rest break half-way through. Game drives consist of moving slowly through the reserve searching for birds, predators and other animals. Dinner: Dinners at the lodge will be a small buffet with starter salad, main entree, side dish, and dessert. All beverages, excluding premium-brand alcohol, will be included. Breakfast: Breakfast at the lodge will consist of various bread and cereal options, fresh fruit and hot items such as eggs, sausage and bacon cooked to order. Morning: We will begin our morning with a game drive in the lodge’s private reserve. In addition to the multitude of mammals resident in the area, there is an immense amount of birdlife present, with over 400 species being recorded in Imbabala's private reserve. Bird species spotted may include: long-toed plover, western banded snake eagle and swamp boubou, as well as red-winged pratincole, purple heron, green-backed heron, and spotted thick-knee. Afternoon: The early afternoon will be at leisure. Following tea, we will embark on a game viewing boat cruise on the Zambezi River. Here we may have the chance to spot wildlife coming to drink and bathe in the river, as well as observe the multitude of birds that gather on the river’s banks. Species seen here can include the African spoonbill, African skimmer, squacco heron, water thick-knee, southern red bishop and all species of southern African bee-eaters. Activity note: The transfer from Imbabala to Chobe National Park takes approximately 30-45 minutes, including the border crossing. Morning: A short drive this morning will take us over the border into Botswana and Chobe National Park, where we will go on a game drive within the park. Chobe National Park remains one of Africa’s prime game-viewing areas. Here, one finds all of the “Big Five,” except for rhino. This is elephant country, home to the largest population of elephants in the world…many of these great grey giants can be seen at this time of year. (Note that seasonality makes a big difference in how much game one will see. If it’s dry, larger herds gather; if it has recently rained, the animals will be more dispersed.) The park forms part of Botswana’s northern-most border and is a contrast of desert aridity and flood plains. The Chobe region is best known for its vast magnificent river and floodplains filled with grazing herds of big game. Buffalo, sable, lion, leopard, hippo, hyena, and many species of antelope find safety in this huge national park. Chobe is one of Africa’s most pristine ecosystems and greatest wildlife refuges. Lunch: Taken at a lodge near Chobe National Park, with a beautiful view over the Chobe River, lunch will be an expansive buffet with numerous salad, main dish and dessert options. Afternoon: During our game-viewing boat safari, we will explore the Chobe River by motorboat, potentially coming face to face with the elephant, buffalo and other wildlife that gather on the banks of the river to drink and bathe. Immersed in this unique environment, we will view numerous birds including African jacana, sacred ibis, blue heron, goliath heron, saddle-billed storks, marabou storks and little egrets. After the boat cruise, we will be driven back across the border to Imbabala Lodge. Activity note: Total transfer time to Hwange National Park is 3.5 hours, done in an enclosed minibus. Morning: This morning, we will head south to Hwange National Park, Zimbabwe’s premier safari destination. Hwange is legendary for its wonderful array of wildlife, particularly the massive herds of elephant and buffalo. Birdlife in the area is also prolific, with more than 400 species found; the birdlife is incredibly varied, with species that frequent teak woodlands as well as those more typical of the drier Kalahari being present. In the summer months, large antelope herds migrate onto the plains, closely followed by large predators. Shallow pans are spread throughout the park, around which wildlife congregates, making for excellent and reliable game viewing. Elephant, Cape buffalo, sable, roan, southern giraffe, blue wildebeest, impala and sometimes even gemsbok (oryx) can be seen here. This park is one of the best for predators - lion, leopard, wild dog and cheetah are regularly sighted, along with the smaller African wildcat, serval, honey badger, civet and spotted hyena. Lunch: Lunches at Ivory Lodge will be small buffets with a starter, main dish, side dish, and dessert. Dishes often vary between brunch and lunch offerings. Bottled water, tea and coffee provided, with additional beverages available for purchase. Afternoon: Before departing on a late afternoon game drive, our Group Leader will give a lecture on elephant social structure, behavior and culling issues. During the game drive, we will search for a variety of bird species including the Kalahari robin, lilac-breasted roller, ground hornbill, eastern red-footed kestrel, Lanner falcon, hobby falcon, and the Steppe eagle, which migrates to southern Africa all the way from the Central Asian steppes. Dinner: Dinner tonight will be a plated meal at the lodge consisting of a salad or starter, main course with side, and dessert. Water, tea and coffee provided, with additional beverages available for purchase. Evening: A short night game drive will be offered in search of the nocturnal species active in the area. Breakfast: Coffee/tea and light breakfast items such as cold cereal, fresh fruit and rusks will be served before the game drive. Morning: On an early morning game drive, we will search for the varied wildlife in the area. Upon our arrival back in camp, a hearty brunch will await us, followed by the heat of the day at leisure. The camp’s viewing “blind” provides a great place to safely observe animals coming to drink from the waterhole in the heat of the day. A guided bush walk will also be available for those interested, where we may encounter wildlife and birdlife as we explore the little surprises in the bush. Brunch: At the lodge, a small buffet will consist of hot and cold breakfast and lunch dishes. Afternoon: During tea, our Group Leader will give a lecture on termites, followed by a late afternoon game drive. Keep an eye out for the Whalberg's eagle, swallow-tailed bee-eater, crested guinea fowl and Bradfield's hornbill. Breakfast: Light breakfast in camp. Morning: On our morning game drive, we will search for birds and wildlife that may have eluded us thus far. Then, we will return to camp for a hearty mid-day meal and the heat of the day at leisure. A guided bush walk will also be offered this morning. Afternoon: This afternoon's tea-time lecture, given by the Group Leader, will focus on lion social structure and behavior. Afterwards, we will depart on our final afternoon game drive. Search for species such as the Steppe buzzard, harrier hawk, Cape vulture and secretary bird. Activity note: Transfer time to Victoria Falls is 2.5 hours in an enclosed minibus. Morning: We will embark on our last early morning game drive of the program. In the late morning, we will transfer from Hwange to the Victoria Falls restaurant where we will enjoy lunch today. Lunch: Taken at a local restaurant with scenic views, our lunch will be a 3-course, plated, set menu offering; bottled water included with additional beverages available for purchase. Afternoon: After lunch, we will be driven directly to Intabayengwe Village, a nearby traditional village. Here, we will have the chance to meet members of the community and see how they live. We will help the local women prepare a traditional meal and see what role women play in the village. The visit will also take us to a local, illegal “moonshiner’s” distillation facility where we will learn about this underground industry. Visits to some of the homes and the local pre-school will round out our afternoon. From the village, we will transfer to our lodge for check-in and the late afternoon at leisure. Dinner: Dinner at the lodge will consist of a buffet with starter, choice of main dishes, variety of side dishes, and desserts. Bottled water, tea and coffee provided, with additional beverages available for purchase. Breakfast: Packed breakfast with homemade muffin, fruit, yogurt, oat cookies, water and tea/coffee will be provided during the morning drive. Full breakfast buffet will be available upon our return to the lodge after the drive, should additional breakfast be desired. Morning: This morning we will start out at sunrise for a birding-focused drive to several local hot spots in the Victoria Falls area. In open-air, 4x4 safari vehicles, we will start in town, driving along the Zambezi River and stopping at the golf course, as well as the water treatment plant; at both locations, we will have a chance to get out of the vehicle and walk a short distance searching for birds. Our drive will continue into Zambezi National Park, moving slowly through prime areas for birding from the vehicle. Species sighted today may include the black eagle, African skimmer, Taita falcon and half-collared kingfisher. Big game animals such as elephant, buffalo, zebra, giraffe, waterbuck and sable antelope may also be spotted inside the park. We will return to the lodge with time to rest and freshen-up before a mid-morning class. Over coffee/tea and refreshments at the lodge, a noted local historian will discuss the story of Scottish explorer Dr. David Livingstone, who first visited Victoria Falls over 150 years ago, and whose journeys laid the ground work for the Colonial era that followed. Lunch: On your own account. Afternoon: Free time with a variety of local activities to choose from. Our Group Leader will lead a birding walk in the area for those of us who are interested. Activity note: Flight time is 1 hour 40 minutes. Morning: Following breakfast, we will have time to pack. Mid-morning, we will transfer to the Victoria Falls airport to board a commercial flight to Johannesburg. Afternoon: Arrive Johannesburg in the mid-afternoon, where we will connect to our international return flights. This concludes our program. If you are returning home, safe travels. If you are staying on independently, have a wonderful time. If you are transferring to another Road Scholar program, detailed instructions are included in your Information Packet for that program. We hope you enjoy Road Scholar learning adventures and look forward to having you on rewarding programs in the future. With a 6,000 acre conservation parcel of Hwange National Park, visitors at Ivory Lodge enjoy unparalleled access to wildlife. A large watering hole on-site attracts the famed Presidential elephants for daily drinks. These elephants symbolize Zimbabwe’s commitment to elephant protection. During your game drives and foot safaris at Ivory Lodge witness a diverse range of habitat environments (open savannah, forest, semi-desert) that invites a mix of buffalo, zebra, impala, elephant, giraffe, and sable. Located in Victoria Falls, Zimbabwe, the A’Zambezi River Lodge is the only hotel in Victoria Falls with a river frontage and jetty site. The imaginative architecture, with its sweeping curve of grass thatch, blends well with the lush green lawns. A'Zambezi is the perfect retreat to relax and unwind in the quiet ambience of the African wildlife and nature, while enjoying renowned service. The majority of the rooms have balconies facing the river and swimming pool whilst the rest face the national park and the gardens.